If you've never made Paella before, give my easy to make recipe a try! 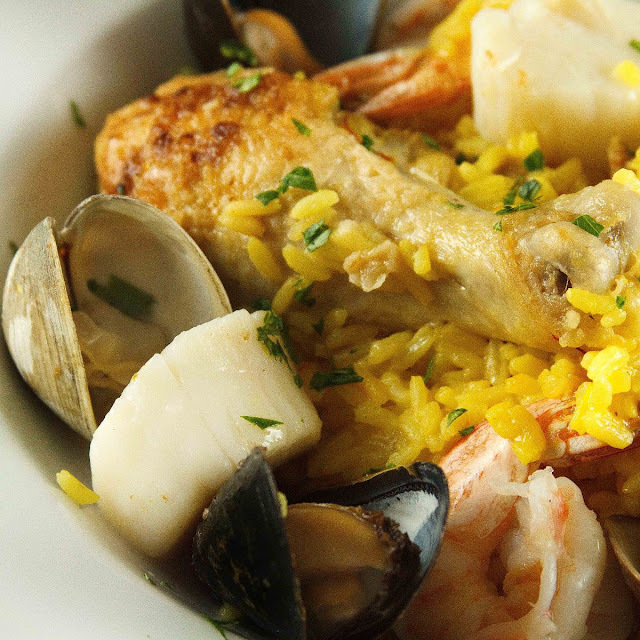 Saffron rice, with shrimp, scallops, mussels, clams, chicken and sausage. I remember the first time I had Paella it was on a school trip to New York, so long ago that it is just a faded memory. Spanish class had taken a field trip and lunch was at a Spanish restaurant where we sampled Paella. Through the years I had Paella whenever I found it on a menu, but it wasn’t until a trip to Nice that I really learned to appreciate the dish. 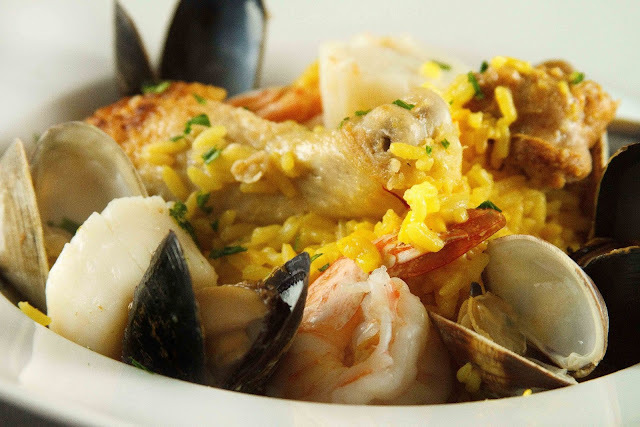 Paella is a rustic Spanish dish but one that can also be found on the finest tables around the Mediterranean. 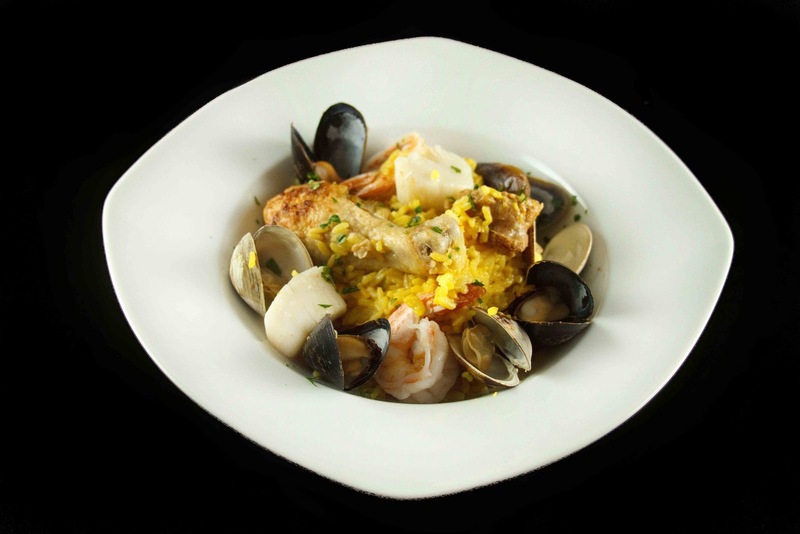 Classic Paella is made with Saffron, infusing rice with the flavor and color that only comes from that delicate pistole of the Saffron Crocus. Saffron has always been one of the most expensive spices in all the world, but luckily you can find it in very small quantities at specialty stores. It is not something you will use as an everyday spice, but its definitely worth the expense for special occasions and a few special dishes! Now I can’t claim it was a special occasion, just a chance to celebrate life, and to remember how lucky we are to be able to enjoy a dish like this for no reason at all. My wife has come to expect a variety of foods since I have been blogging, most much simpler, but I try to have one very special meal at least once a week. Since we don’t eat out very often, the expense doesn’t seem quite so much, I always try to think of how much dinner would have been if we had eaten the same meal out….so in that respect I am saving us money! What I do try to do is incorporate other foods we are having during the week for lunch or dinner, and that helps bring the cost of the dish down if you can think of it in those terms. We have clams once a week so I pull 10 out of the bag if we have mussels for lunch one day I pull 10 out of that bag. That still leaves us with more than enough for the meals and gives me extra seafood to work with to come up with those extra special meals. You only need a few shrimp and scallops for the dish and those you can buy by the piece which will come to less than a half pound each. Chicken and sausage are not too expensive, so the only other cost you have to worry about is the saffron. Now it doesn’t seem quite so bad when you think of it in those terms, does it? At least that’s my logical approach to it! In any event, if you can make it, please try it, you certainly would wow any guests that might be over for dinner, just serve it with some homemade sangria and you’ll be living! 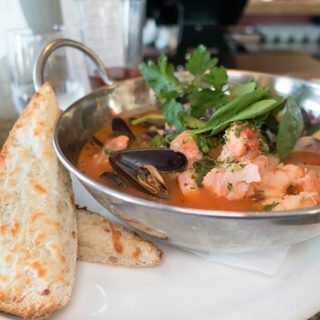 Although this dish needs no help in being delicious, we do eat with our eyes! It certainly won’t hurt to make it pretty! 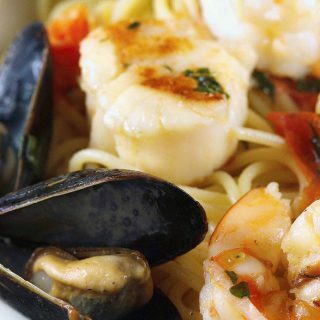 Do you like seafood dishes? 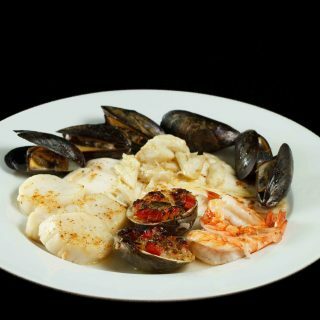 Then why not try my Ligurian Seafood Stew? There you have my take on a classic Spanish dish, that really isn’t difficult to make but is definitely a show stopper! Next time your planning a party, why not give Paella a try, I know your guests will be happy you did! 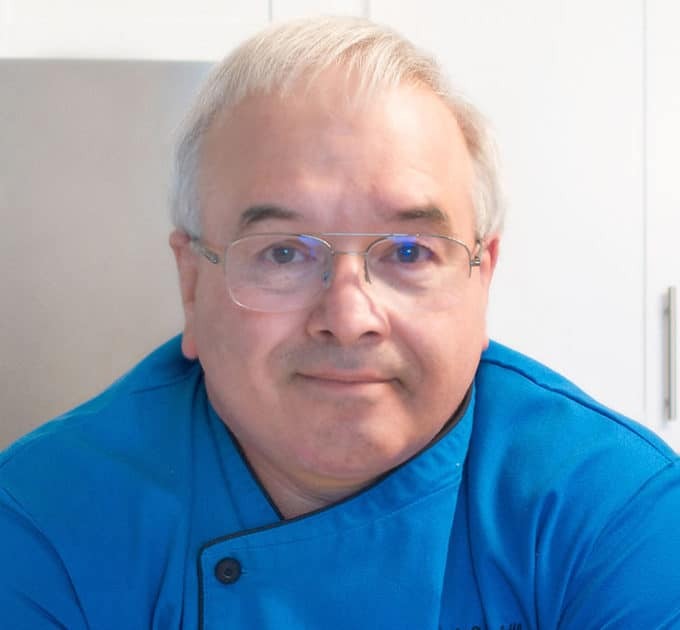 If you’ve tried my Paella recipe or any other recipe on askchefdennis.com please don’t forget to rate the recipe and let me know where you found it in the comments below, I love hearing from you! You can also FOLLOW ME on Instagram @chefdenniseats and @chefdennistravels, Twitter and Facebook. Start by first browning the chicken legs and the sausage. Coat the chicken legs in flour seasoned with salt and pepper and add them to a large skillet to brown on all sides. After removing the chicken add the sausage and brown that too. Neither the chicken or the sausage have to be cooked completely, but they should be at least 3/4 done. Set the chicken and the sausage aside until later. Add in the chicken stock and the saffron and mix well, allow the liquid to start to boil, then reduce to a simmer and allow to slowly cook for 15- 20 minutes. At this time the rice will be almost done, mix in the saffron a little more without disturbing the rice too much, and then add your seafood, chicken and sausage to the top of the rice, cover and allow to continue to simmer for 10-15 minutes or until the clams and mussels have opened and the scallops are completely cooked. 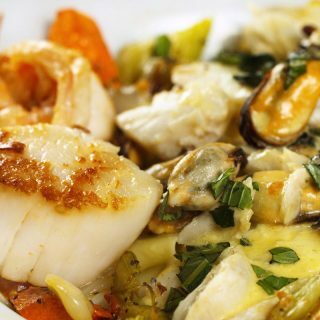 The flavors from the juices of the seafood, chicken and sausage will add so much to the dish, making it a symphony of flavors! 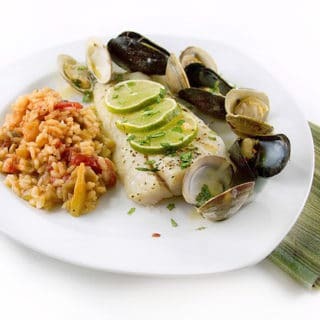 Gently remove the seafood, chicken and sausage from the pan and begin by serving a good portion of rice in a bowl, then add all of the other ingredients on top of the rice to make a spectacular presentation. 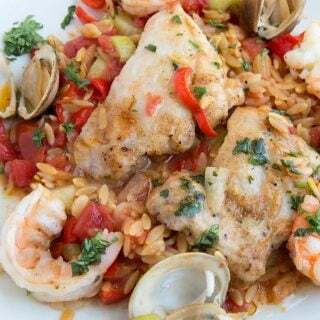 Previous Post: « It’s Guest Post Friday with Diethood and Win a Copy of Dorie’s "Around My French Table"
Your paella looks great! Surprisingly the best paella I have had was not in Spain but also in South of France with everything from chicken – lamb and seafood in it! a truly glorious meal Dennis…I LOVE saffron….trader joe's has a STEAL on saffron…(I am not the expert on saffron, so does anyone know if Trader Joe's is a good quality of saffron? sure fits the budget!) – and I couldn't agree more, eating at home, especially in this economy is favored in our house, and I don't mind splurging on "the high grade" quality ingredients hehe…. Dennis I love paella and yours looks fabulous! I always order it when I see it on a menu too! I've just recently started getting into saffron and it is delightful! I've never had paella but I've been wanting to try it for several months now. Maybe when I get to Austin and have a better food selection I'll try my hand at it.